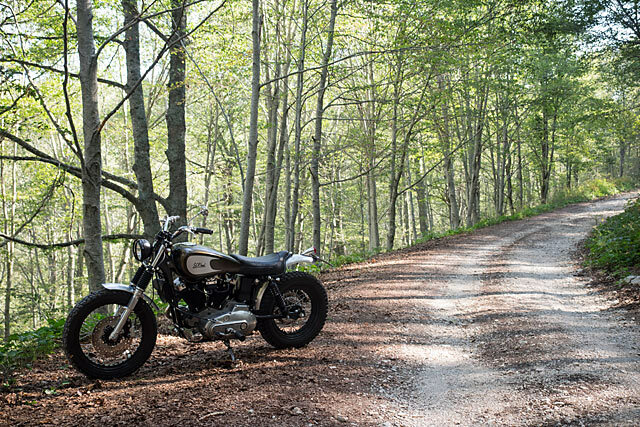 The idea to create the Scramblerhead came about out of a pure desire of Filippo’s to set himself a challenge and see if he could pull it off. 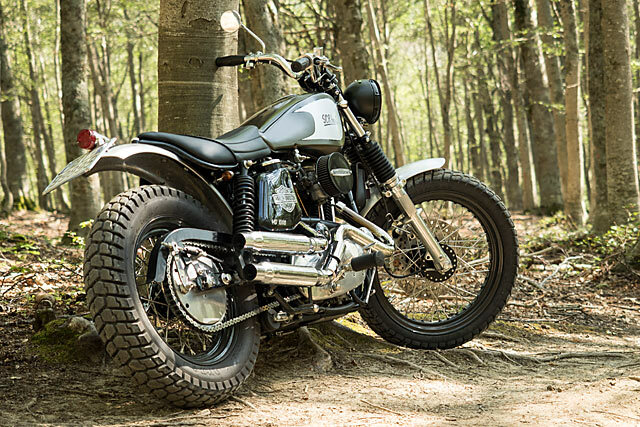 Buying another Harley and starting from scratch is something anybody could do, but to create two truly unique custom motorcycles from the one donor bike, now that’s a head scratcher. 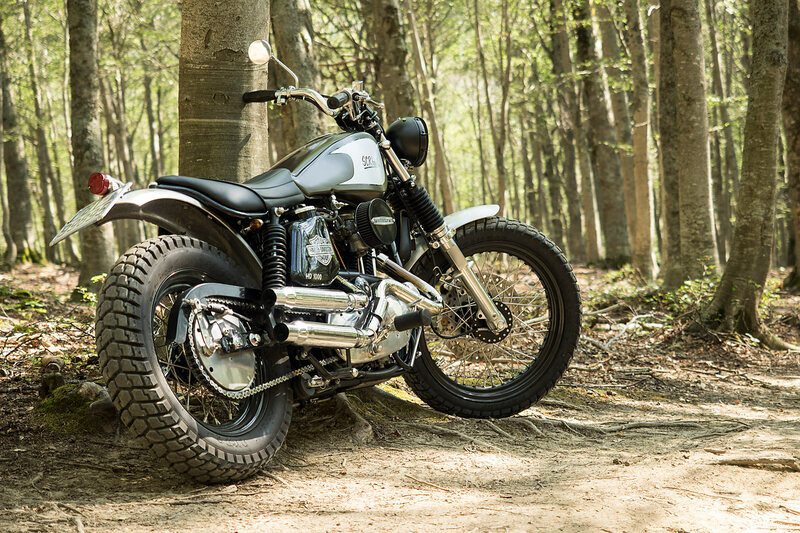 “SCRhead was born from the need to transform a bike, rigid and definitely not well suited for long distances, into a versatile motorcycle on various roads,” explains Barbacane about his plan. But it was not as simple as bolting on a different seat, add a set of flat bars and some knobby tyres and calling it job done. 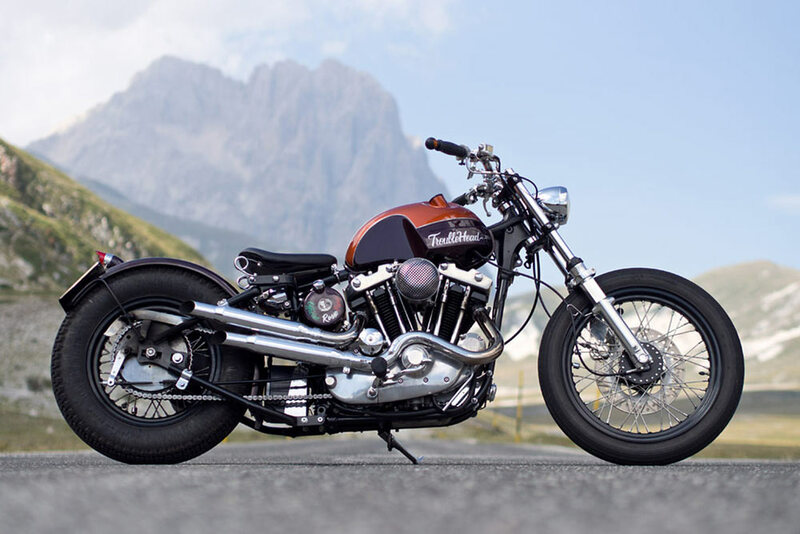 Officine Rossopuro had created a truly wild chopper, the frame had been hard-tailed and given a tyre hugging fender, the tank was a one-off creation with wild lines and crazy paint, the forks were long and the exhaust barking mad. 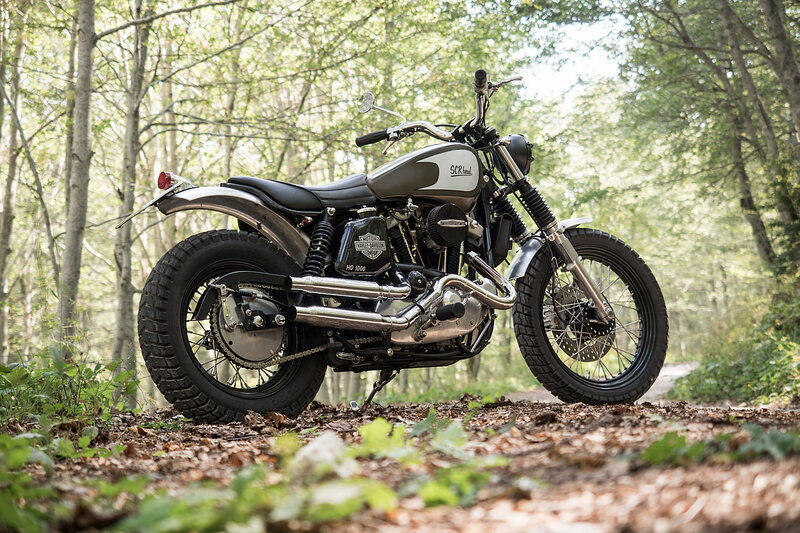 So to build a scrambler the HD would have to be returned to its bare bones and all the custom fabricated parts that had taken hundreds of hours to create removed and put aside. Some might consider this a fairly mad thing to do, but Filippo enjoys nothing more than pushing the boundaries each and every time, with a distinct Italian flair. The first job with the bike back to a bare frame was to remove the rigid rear end and re-design a new twin shock platform. 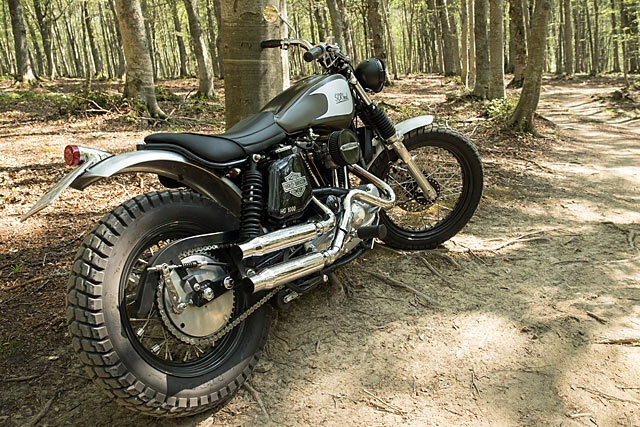 But rather than simply grabbing an entire Sportster tail section and make do, Filippo wanted to ensure the rear would be able to handle off-road duties. A Harley swingarm slots into place but the entire subframe is Italian hand crafted steel with repositioned shock mounts. From here the subframe loops up and in, towards the centreline of the tyre creating a piece of form and function rarely seen on such a utilitarian machine. These new lines allow for the raw steel fender to have improved clearance over the tyre and prevent any bottoming out. 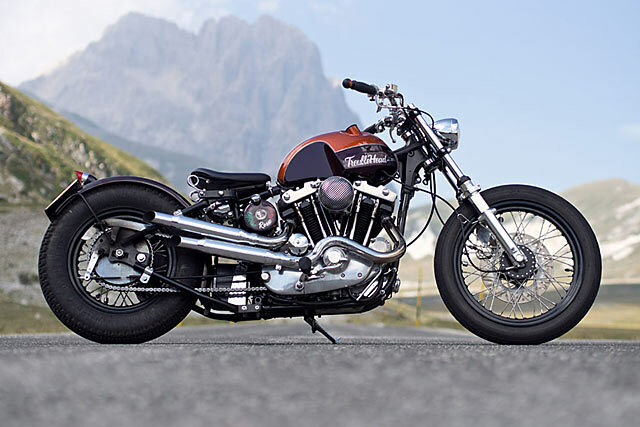 Joining the Harley swingarm with the Filippo created tail section is a pair of custom-built rear shocks, progressive springs and weight matched dampening a far cry from the once rigid frame. But there were more changes required, with the raised rear and new twin shock setup the transmission mounts needed a slight shift. This ensures the rear end geometry is spot on and that the chain runs back to the sprocket without any nasty twisting due to misalignment. Up front the once were over stock front forks have been returned to their natural Ironhead state in terms of length. Then to match the new rear shocks and best suit the go anywhere intent of the bike Filippo rebuilt them with all new springs and the corresponding weighted oil. 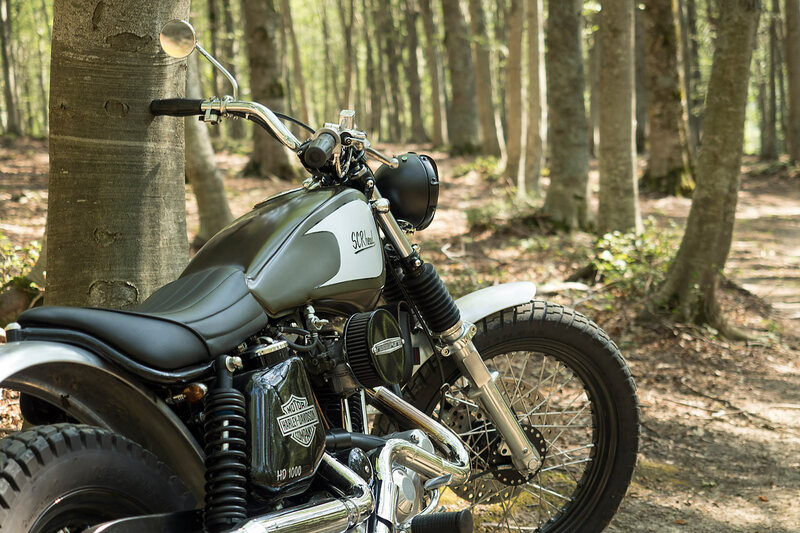 A fork brace adds some extra stiffness to telescopic forks and provides the perfect mount for a hand rolled front fender in raw steel to compliment the rear. With the triple clamps re-painted and a set of fork gaiters fitted up the transformation from easy rider to scrambler is complete. 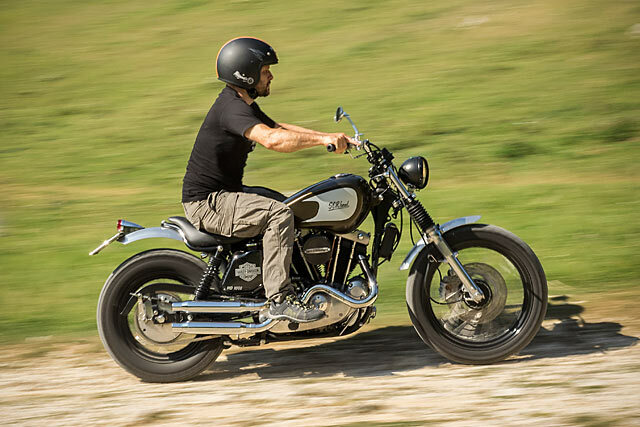 That seat, like all those that run off the slick Officine Rossopuro production line is a brilliant mix of style and full days in the saddle comfort. Filippo likes to merge the seat with each tank creating a smooth transition between the two, mating together, one cocooned around the other. But rather than finish the rear of the seat in traditional scrambler fashion he chose to follow the intricate lines of the new subframe for a truly custom look. 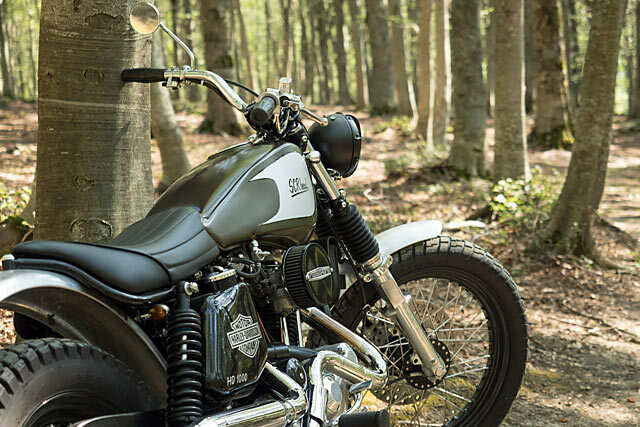 While the tank swaps the bold purple and orange finish of the chopper for a subtle white and deep bronze that only shows its true colours when struck by the full force of the sun. 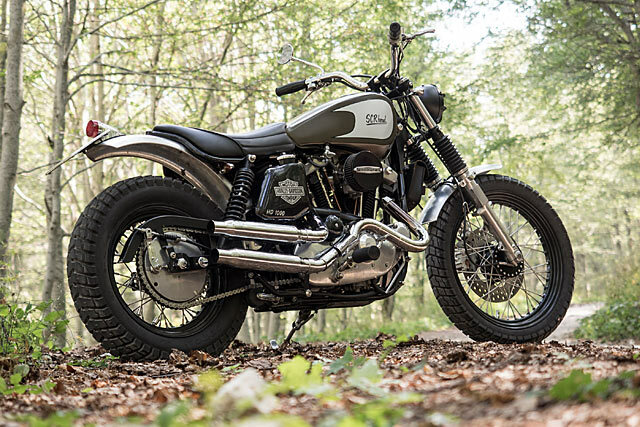 Of course the power comes from the old warhorse of the Harley range, the Ironhead. 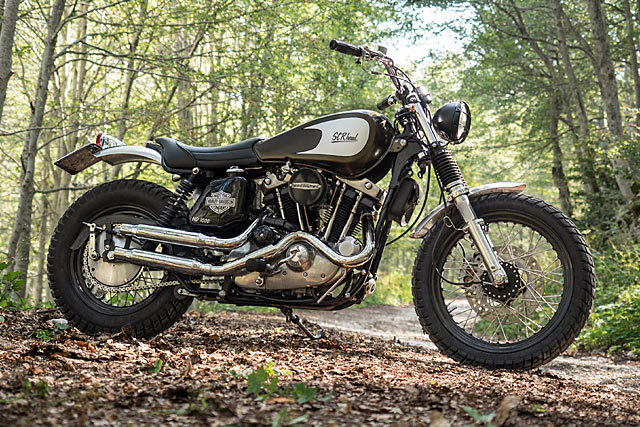 The vast bulk of customs these days might pack an Evo or look to the past in the form of a Knuckle or Shovel. But the reality is the Iron provided a significant improvement at the time and the benefits translate to a scrambler brilliantly. A bigger bore and shorter stroke, with improved heads give better breathing and the sort of RPM versatility these crazy contraptions need to go anywhere at a range of speeds. Rather than follow the crowd and bolt on catalogue parts Filippo chose to give the Iron a truly Officine Rossopuro hot up. It starts with one his trade mark exhaust systems that never fail to impress. 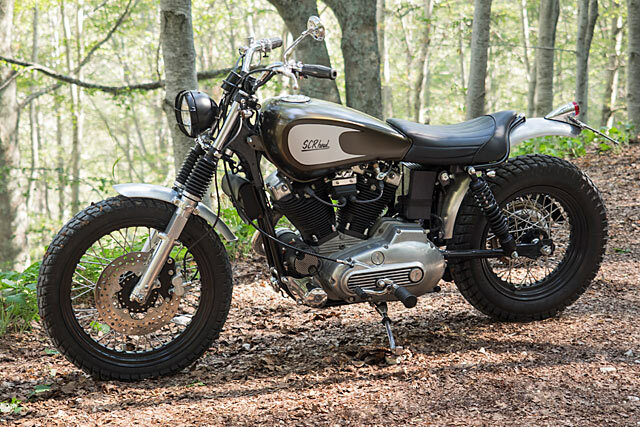 A 2 into 2 design it hugs the contours of the bike beautifully and finishes with under-over stacked mufflers, all resplendent in chrome. It’s certainly a change from the slash cut look on the chopper version, as is the air filter which has been swapped out for a performance pod filter. The barrels have been painted black, with the rest a mix of polished metal and chrome that beautifully mimics the XR racer finish from back in the day. “The instruments, lights and accessories were kept to a minimum considering the weight savings. The battery is now a reliable and smaller Spark 500,” says Filippo who was keen to keep the bike all about the job at hand. So to give better steering control in any tricky off-road conditions, a set of 1 inch old school scrambler bars slot into place. 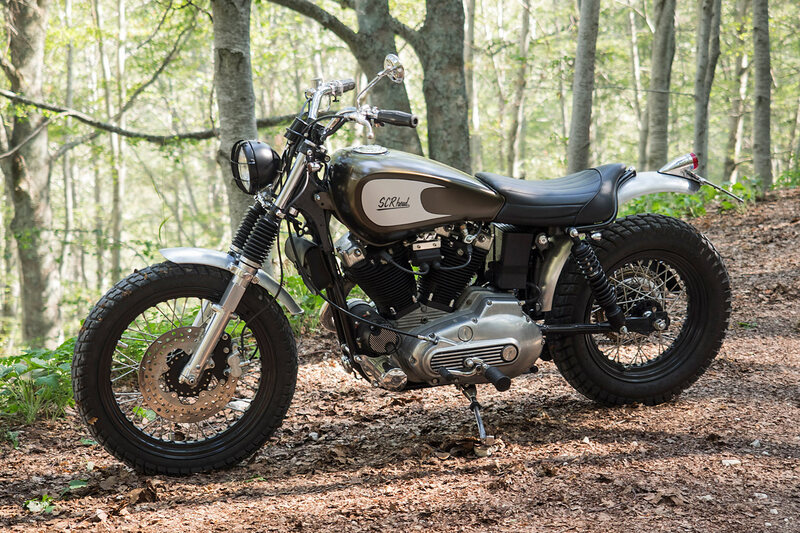 Mounted up on the new bars is a more powerful master cylinder from Kustom Tech that sends force to a twin piston caliper and drilled rotor from Brembo. Finally the hubs were stripped completely and re-laced with stainless steel spokes and lightweight alloy rims. Measuring 18 inches at the front and 16 in the rear it’s a far more off-road friendly combination, especially when wrapped with all-purpose rubber. An enthusiastic Filippo primed to ride finishes out the brief, “The HD is now ready to face the urban jungle with great ease, a full and vigorous engine that makes people forget the almost 40 years that it has on its shoulders. 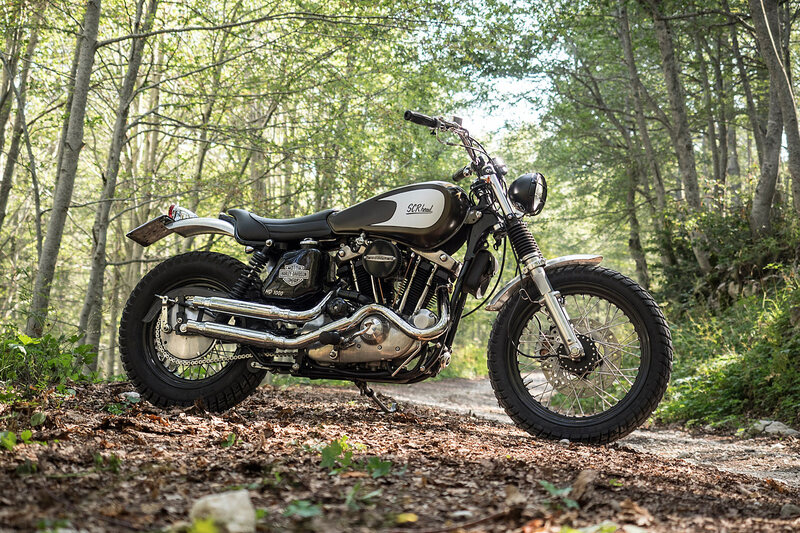 The proof with these bikes is not only are they now made to be looked at but to be used and enjoyed.” Who knew one bike could both roll into Sturgis or race through the Italian hills? 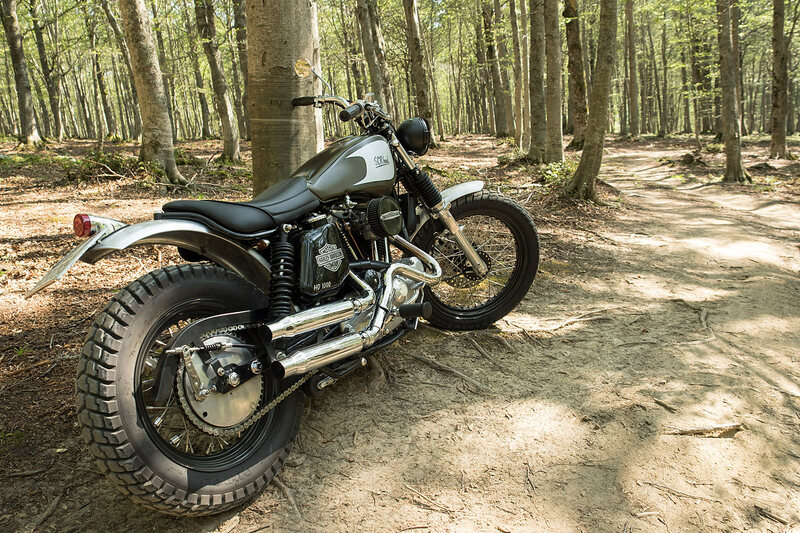 The answer is simply in the endless and unlimited imagination and fabrication of the man behind Officine Rossopuro, now having created a truly two-headed monster.